Oh, hold on a moment, I’m being notified that Lady Liberty is a leftist scourge. That’s the opinion of Breitbart editor John Carney, whose ire was raised by a Vogue cover featuring actress Jennifer Lawrence with the Statue of Liberty in the backdrop. “The Opposition Media can’t even do fashion without attacking us” he protested in a tweet. I’d hate to see what Mr. Carney thinks of bald eagles, apple pies, and baseball games. It turns out, however, that in Trump’s America, Lady Liberty is leftist propaganda. Senior policy advisor Stephen Miller was quick to advise CNN’s Jim Acosta that the famed poem of welcome was added to the statue after the fact, and that the statue is intended to be a symbol of “American liberty enlightening the world.” Consider us enlightened, Mr. Miller, that the plaque bearing Emma Lazarus’s poem “The New Colossus” was not added to the Statue of Liberty until 1903. Of course, the poem itself was written in 1883… to raise funds for the construction of Lady Liberty’s pedestal. So, to be very clear, he was referring to the Statue of Liberty as a “sacred object” of the American political left. At this point, though, Carney might be right in a sense – whether we take Miller’s interpretation or Acosta’s, the statue’s message is no longer being echoed in the halls of government, not with a Republican administration having taken hold. America’s shining beacon has gone dark, and for nobody is that more clear than the so-called “Dreamers,” the beneficiaries of Barack Obama’s Deferred Action for Childhood Arrivals (DACA) policy instituted in 2012. For a decade, Congress has tried and failed to institute an official legislative outreach for minors brought into the USA illegally by others. Neither Democratic nor Republican legislatures were able to come to a basic and humane decision to support these children, despite proponents on both sides of the aisle. One way or another, there has always been sufficient malice, cruelty, ignorance, or rank cowardice to bury the hopes of Dreamers. Trump mouthpiece/punching bag combo platter Jeff Sessions was the one sent to speak to the media about this wonderful new policy change, bringing out the “compassion” of enforcing immigration law to its fullest extent. Trump himself declared his love for Dreamers. Republicans on Capitol Hill, meanwhile, were much more candid about what this move really translates to. Arguably, Trump doesn’t want to take the political heat of expelling people in the same class as those who have saved American lives, fought for their country, died to help others, or contributed to economic growth – it’s notable that despite his love of “get tough on immigration” rhetoric, he sent Sessions out to announce it in his place. This is because Republicans have been advocating for Trump to exploit the Dreamers and DACA in order to get a trade from Democrats – we’ll leave these people alone, at least for now, if you give us wall money. The problem with that, of course – notwithstanding the naked willingness to either engage in cruelty or knowingly disregard the much-ballyhooed “rule of law” – is that Trump has zero self-control and a serious addiction to praise from the worst corners of the nation. He made the DACA announcement well before starting up any buzz about a deal for wall funding, and chances are that he won’t take part in such negotiations. Having just taken a “tough on immigrants” step, Trump can’t very well back down from it. His Republican allies, meanwhile, recognize that he’s dumped the mess onto Congress – and early feedback suggests they aren’t willing to play ball. Red-state Democrats, previously willing to knuckle under and vote against legislative solutions such as the DREAM Act, are now openly castigating the cruelty of this measure. Moderate Republicans are looking at a new version of the bill, one which would formalize DACA-type protections. In short, the only person whose rump isn’t covered at this point is Trump – his allies have openly asserted the fluidity of their “legitimate grievances” with DACA if it means advancing a different Republican priority, and it’s hard to take “rule of law” seriously when it’s a bargaining chip for a vanity project. The question is, will anyone really notice? Is there a voter demographic out there that will question what values Republicans are championing if the Statue of Liberty is their enemy, the rule of law for sale for $20 billion in concrete and rebar? 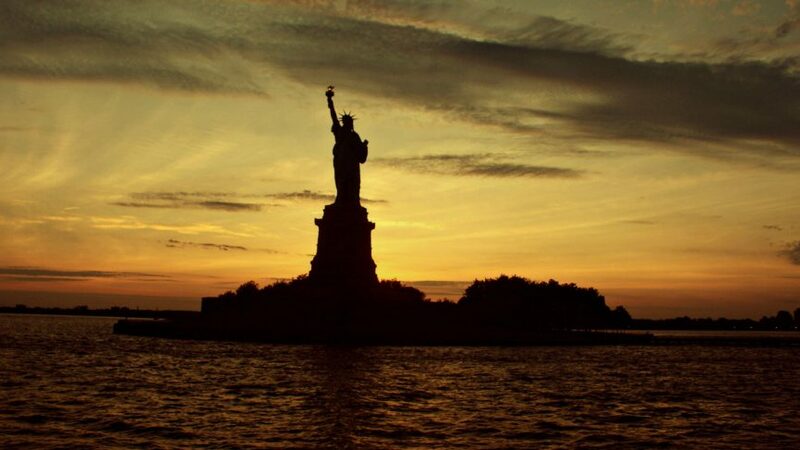 In Emma Lazarus’s poem, Lady Liberty is given a different name: Mother of Exiles. The DACA beneficiaries are her children, illuminated and made brighter by America’s liberty. These men who seek to expel them from her shores are the outsiders, the enemy – they are parasites devoid of America’s values, recasting a history of immigration and hope to tell a story of spontaneously generated exceptionalism that is the envy, rather than the dream, of the rest of the world. In doing so, they darken that same light that called the best and brightest forebears of America’s science, education, innovation, and industry to dare the ocean in search of opportunity.